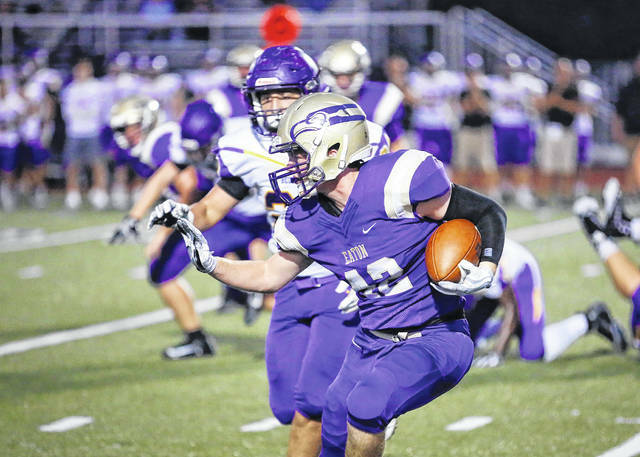 Eaton’s Gabe Mirovsky looks for running room during the Eagles homecoming game with Bellbrook on Friday, Oct. 5. Eaton dropped to a 0-7 on the season with a 41-6 loss. 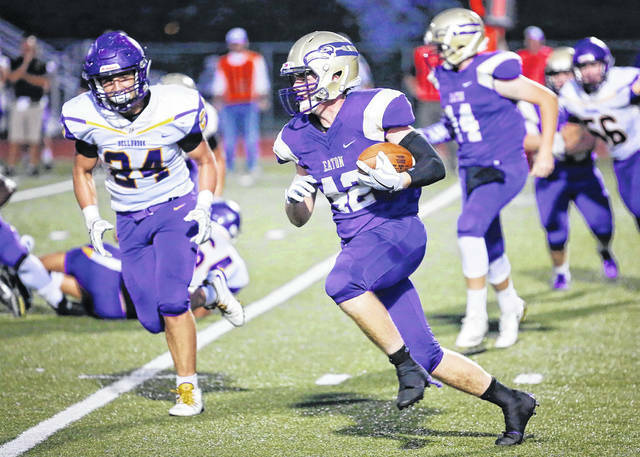 PREBLE COUNTY — Eaton’s football team dropped to 0-7 with a 41-6 loss to visiting Bellbrook on Friday, Oct. 5. Eaton allowed the visitors to score on their first six possessions of the game — all in the first half — to take a 41-0 lead at halftime. 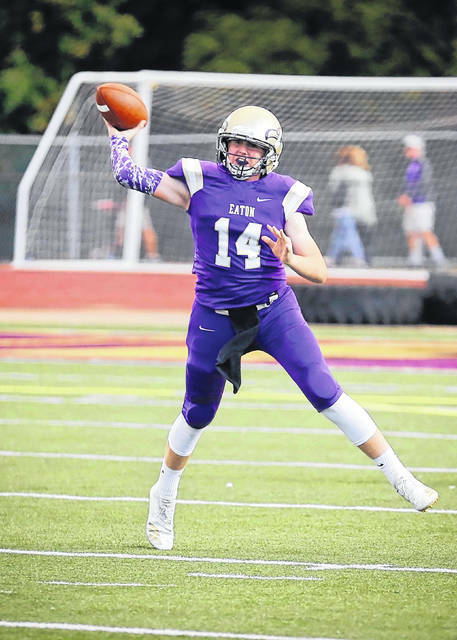 Eaton, which was celebrating homecoming, scored on the game’s final play, a 5-yard touchdown pass from Dawson Blaylock to Zac Schmidt. Bellbrook scored on a 44-yard TD pass with 8:43 left in the first quarter for a 7-0 lead. They added a 60-yard run for a 14-0 lead with 3:02 remaining in the first quarter. They closed out the scoring in the first quarter on a 28-yard TD pass with :11 left for a 21-0 lead. 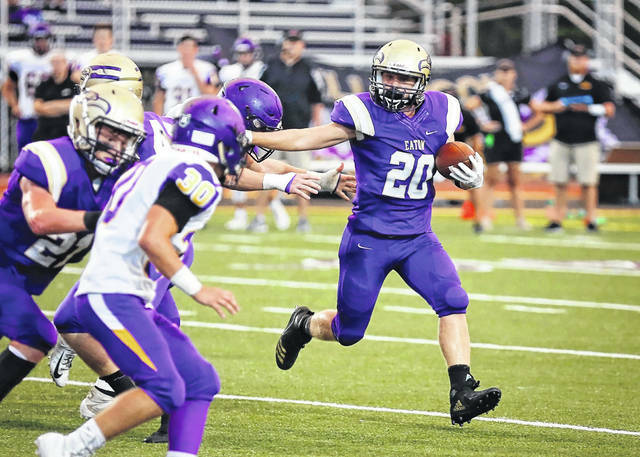 In the second quarter, Bellbrook scored on a 10-yard pass, a 26-yard run and a 34-yard run. Eaton will remain home this Friday to host Franklin. Preble Shawnee scored the game’s first points on a field goal, but failed to score again in a 36-3 loss to visiting Milton-Union. The Bulldogs took a 14-3 lead after the first quarter and held a 28-3 lead at halftime. Shawnee, which has dropped five straight, is now 1-6 overall and 0-3 in the SWBL. The Arrows will host Dixie (1-6, 1-3 SWBL) on Friday. 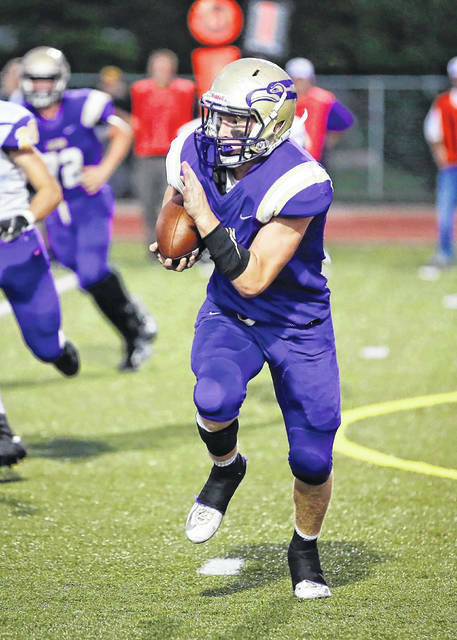 https://www.registerherald.com/wp-content/uploads/sites/41/2018/10/web1_EATON-FB-5.jpgEaton’s Gabe Mirovsky looks for running room during the Eagles homecoming game with Bellbrook on Friday, Oct. 5. Eaton dropped to a 0-7 on the season with a 41-6 loss.